When shopping for my dorm room, I decided to buy towels that I could embroider. Yes, it does take time to embroider, and perhaps my time would be better spent on other things rather than towels, but it's the little things that give me joy. I knew that I'd be seeing the towels every day, and it would be a little homey and feminine touch that I could add to my room. I worked on embroidering the towels while I sewed with Jubilee, watched DVDs, listened to the radio or a CD, or just enjoyed the silence. I got the border patterns out of a embroidery book I have, and the butterfly pattern off of another Bible verse pattern I'd embroidered. It was fun to pick all the different pretty designs, patterns, and colors to use! 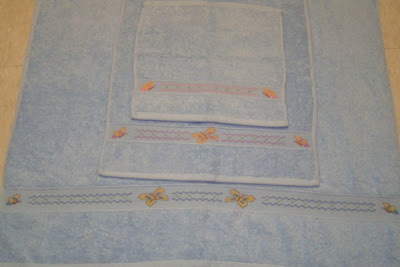 The first bath towel, hand towel, and wash cloth I completed before I left for college. 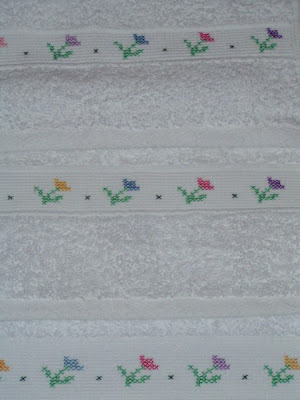 I had fun stitching a garden on the snowy white cotton. The towels weren't actually made for cross stitching - they're just regular ones I found at Walmart! However, the band with ridges makes a very nice place to embroider, though it is a bit harder to make even stitches since it doesn't come with nice, evenly spaced holes. So, my tape measure was invaluable! These last ones took a bit longer to complete. I finished the wash cloth and began the hand towel before I left, but didn't have time to finish it all. So, I've worked on them in the spare moments I've had since getting to college, and finally finished the bath towel on Monday. 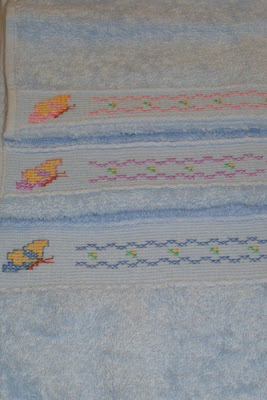 I enjoyed doing the same pattern but different colors on each towel. It makes them match, but still be unique! So, when you calculate how many times I'll use these towels and the happiness I get when I sew the lovely embroidery, the time spent making them was definitely worth it! Those are nice. How are you doing laundry now that you are in college? Do you have access to machines on campus or do you go somewhere off campus? Those are so cute, and definitely inspiring. Those are really cool!! Thanks for sharing. Beautiful. 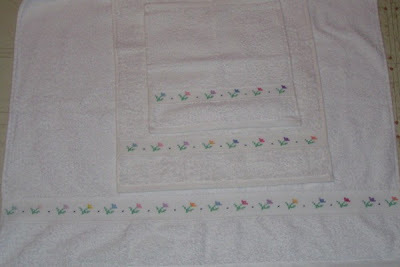 I may have to keep embroidered bath towels in mind, for I am usually quite gentle on mine and they last so long. But my mother would be appalled if I ever embroider dish towels, since she thinks it is a waste- and I might agree with her. Do you? That is awesome! Now I want to do it. Are the designs double sided? I will definitely think about trying this myself. Beautiful job Anna! I will have to keep in mind about the regular towels. I don't usually do well cross-stitching on rgular cloth and not aida cloth but I will give it a try. I'm glad you are finding time to keep up with such things while in college. It's important!! I used to take my hand sewing projects on chorus trips - nice long bus rides! You are going back to Alabama for your sister's wedding, right?! Laura: There are washing machines and dryers on the 4th and 1st floor in my dorm, so I do laundry here. They are free as part of our housing payment, which is nice! Maria Pauline: Actually, I have embroidered dish towels for other people. =) I think it's very pretty, and those towels are usually only used for special occasions, so they don't wear out as quickly. 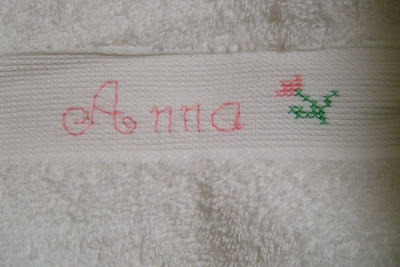 If I have a home of my own, I'll probably embroider some dish towels for special use, and not others for other use. I guess it just depends on what you think is a good use of your time. I find great joy in small things like embroidered towels, and I do it in spare moments or while listening to/watching something else, so I don't think it's a waste - in moderation! Laura: No, the designs aren't double sided. The wrong side definitely doesn't look as pretty. =) However, you usually only see one side, so it doesn't really matter. Anonymous: I wouldn't miss my sister's wedding! I head for home tomorrow - it will be great to see family again! I can't believe my sister's getting married in 2 days - so exciting! You did a good job with the towels.It's the little things that help to make a house home. Congratulations on a job well done! You did an excellent job. I think it will add a nice touch to your dorm, and better yet, you had fun bringing useful items to the next level. They are works of art! Very lovely! Have a wonderful time seeing the family again! Your towels are lovely! I really like the blue set. Those are so lovely! Good job! Your work is very inspiring!